This Sunday the nation woke up to the sorrowful news of Bollywood Diva Sridevi’s sudden death. Initial reports claiming that she suffered cardiac arrest were disbelieved by many. What ensued was prime-time debates rife with speculation and deplorable tactics, discussing the possible causes of her death. 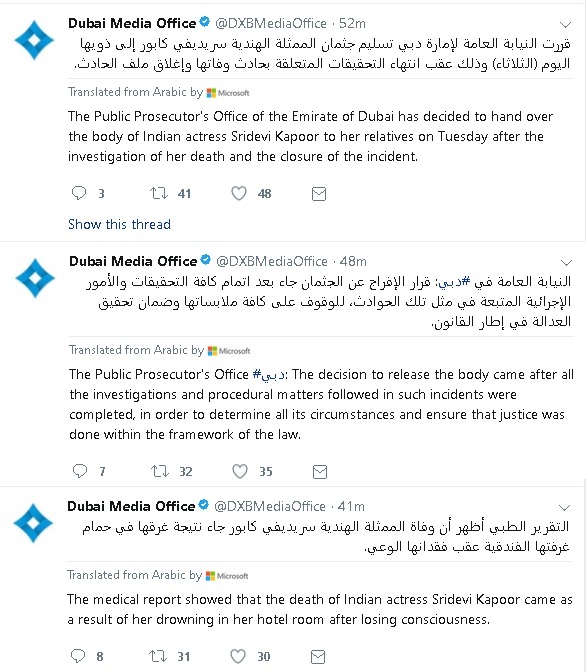 The office says that the Public Prosecutor’s Office Dubai has decided to hand over the body of Sridevi Kapoor to her relatives after the investigation of her death and the closure of the incident. The decision to release the body came after all the investigations and procedural matters followed in such incidents were completed, in order to determine all its circumstances and ensure that justice was done within the framework of the law. The reason for unconsciousness however has not been disclosed by the media office as of now. Will this closure bring an end to the gossip in Indian media circles? Or will it raise even more questions?